I wish I hadn’t promised to show you my coupon binder today. I should have led up to it gradually. I would hate for those of you who aren’t already familiar with my obsessive-compulsive tendencies to be frightened away so soon. Certain of my family members actually pretend they don’t know me when we are out shopping. That big lime green binder propped in the child seat of the shopping cart is rather conspicuous. But I didn’t embarrass them much in their teen years, so I feel entitled to do it now. Today I am just going to give you a very brief overview – a thesis statement – of how I shop. For the next week or two, I will elaborate on the process. As way cool as my coupon binder is, it’s not the most important part of shopping. The single most effective tool for feeding your family on a budget is Meal Planning. I start by printing out a blank calendar for the month. I do this from MS Publisher, but you may prefer an alternative. 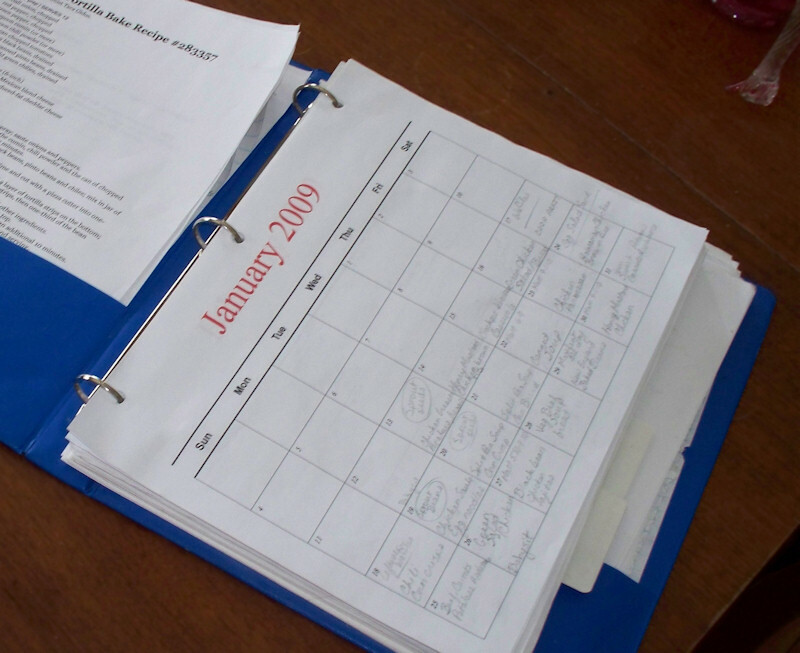 I like to use plain paper rather than a glossy wall calendar, because 1) I like to keep it in my Household Binder (more about that some other time) and 2) I use a pencil while planning. Pencils don’t always write well on glossy paper. Tomorrow I will explain how I do meal planning. I also collect sales flyers from all of the local stores – in my town, I have Walmart, Walgreens, Aldi, one upscale grocery store, and two regular grocery stores. Each of those two has a few local branches but are not part of a national chain. All of my stores are on the same road, but if they weren’t, I would combine shopping trips with other scheduled activities in the same area rather than drive all over town on the same day. Even more than the paper flyers, I use the Internet. I have links to the specific stores as well as many “Frugal Shopping” blogs and websites in a folder in my “Favorites”. Notice that if I were coordinated enough, I could listen to my mp3 player while I shop. That little black and white circle is an opening for ear buds, and the player goes in the zipped compartment. I guess the binder was really designed for teenagers. I use the compartments and pockets for pens, scissors, calculator, etc. Dividers with pockets keep shopping lists and coupons for each store separate. There are accordian folders on the inside of the front, and I usually keep the sales flyers in there. Plastic sleeves designed for collecting baseball cards are used to separate coupons. The coupons are divided into categories with tabs so I can quickly find what I am looking for. I just flip through the tabs to find what I am looking for. Yes, it did take a while to get organized. Fortunately, I am a nerd (at least, that’s what my beloved affectionately calls me when I get excited about my latest MS Excel spreadsheet) and this is my idea of a good time. 😀 Once it is set up, it’s fairly low maintenance and I become more efficient every month. It’s not about how much money you save – it’s about how little you spend. We are living abundantly these days while spending very little.